Action Alert - Need your help again in the People v. Rinehart case! Sorry for the late notice, but we just received an urgent request from attorney James Buchal and the New 49er's. 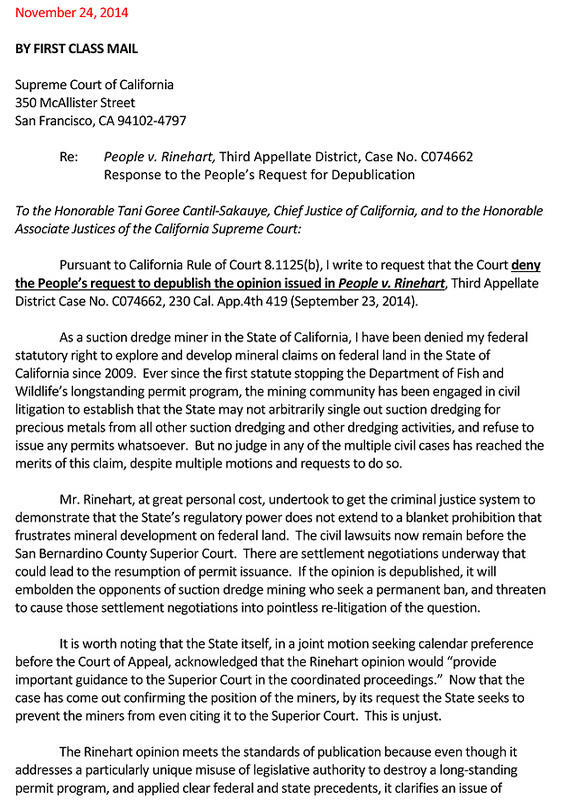 On 10-1-2014 we requested miners send in letters to the California Third Court of Appeals and ask them to publish their recent decision in People v. Rinehart. The court had ruled that Rinehart should have been allowed to present evidence that federal mining law preempts state law at his trial for suction gold dredging without a permit -- a permit that the State of California refuses to issue. Hundreds of miners sent in those letters and the court agreed to publish their opinion, which would allow the opinion to be used in other state courts. 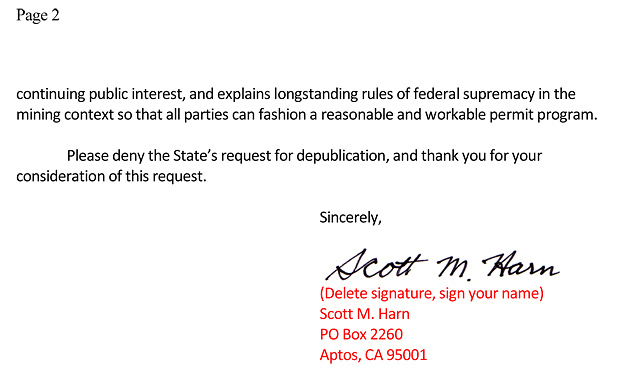 Now the State of California has petitioned the California State Supreme Court and asked them to "de-publish" the opinion! Buchal believes it would help our case if miners would send letters of opposition to the Supreme Court. These letters must reach the court within ten days of the petition. That means they must arrive by Thursday, November 27 -- Thanksgiving Day. Obviously the court will not be open on Thanksgiving Day. We do not know at this time if letters will be accepted on November 28 due to the holiday, so our letters are going out today. 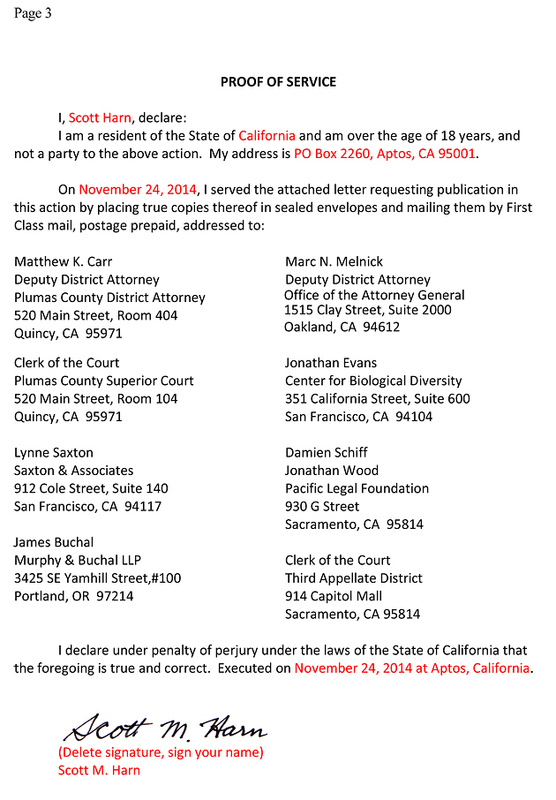 To request the CA Supreme Court deny the "de-publish" request, each of us needs to send a formal request. Court rules state that such letters must be sent to each of the parties listed along with the court. It's a total of nine letters -- one to the CA Supreme Court, one to the Third Appellate Court, and one each to the other seven involved parties. You must send all three pages to each party. All copies must be signed and dated in the appropriate spots. You can download the letter I sent today (in Microsoft Word format) -- the red type is what you will need to change. You are certainly welcome to change the wording.